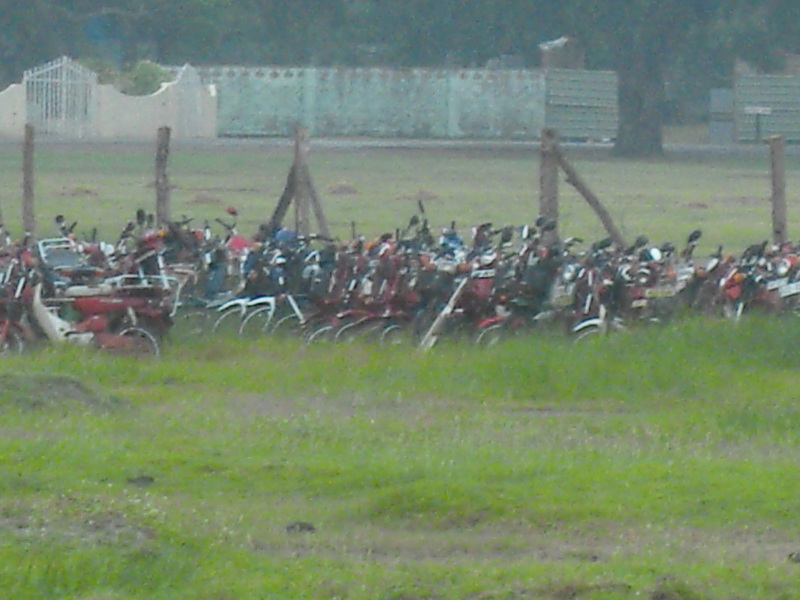 The magnitude of this pilgrimage of the oppressed can be gauged from the vast numbers of bicycles and motor bicycles collected in the strip of land on which the LTTE made its last stand. There are thousands, in a few separate lots, and most of them seem in a reasonable state of repair, so it should not be too difficult to restore some at least to working order and give them to the resettled people. The cars however are another story. Many of them were deliberately wrecked, several in a final conflagration which the Tigers precipitated in their version of a Gotterdammerung, the twilight of the divinity they had exercised over the people for over two decades, ever since they claimed, on the grounds that they had fought the Indian army, to be the sole representatives of the Tamil people. That they should have finally got the TNA to accept this position too, after having killed off any leader who presented a challenge to them, is a mark of the power of violence – while the graveyard of the motor cars is an object lesson in how violence finally rewards itself. It is not only cars. There are many sophisticated vehicles, most prominent a UN lorry with markings of both WFP and IOM. I was reminded, seeing it, of how an American diplomat expressed surprise that the LTTE would help itself to food direct from UN vehicles. They had fondly imagined earlier that the UN was able to resist pressure, and it was only the natives who handed over to terrorists rations for which the US amongst others had paid. But the tyranny of the Tigers encompassed everyone, white and black, rich and poor, even though a few pretended until the very end that things were not so bad, and that they themselves had not played ball along with the rest. Incidentally, the government has very sensibly continued to use the services of the poor state sector employees who had to work under Tiger duress over several years. There are those who advocated a witch hunt, but the manner in which these generally excellent public servants did their duty by the people in spite of the difficulties they faced has been acknowledged and they are now doing even more to support resettlement efforts. The manner in which they work together productively with the military, which still has to provide massive logistical support, is an object lesson in how reconciliation and mutual confidence can be ensured in the absence of tyranny and insecurity. Meanwhile Mr Prabhakaran himself stayed in a complex north of the main road which included a concrete bunker three stories deep, with a sophisticated toilet and heavy internal doors and a small space under the last stair where presumably he could have crouched to escape even the heaviest of bombs. There were two large craters nearby, suggesting how close the air force had come to getting him, but neither the bunker, nor the house he usually stayed in, had suffered damage.